What is skin & hide tanning? All animals have a skin covering their flesh and fat. Skin is made up of a number of layers, and is predominantly a fibre network of interlocking spiral proteins. Hide tanning is the process by which a raw skin becomes preserved. This means that after the tanning process, the skin should be a stable material, and not rot or be overly attractive to animals and insects. This process generally takes the form of a chemical stage and a physical manipulation with lubricants such as oils. Finished buckskins – brain tanned and smoked. Emulsifiable oil tanning – sometimes called brain tanning, or smoke tanning. This process involves using an emulsifiable (mixes with water) oil such as brains or egg yolks whilst working the skin soft (physical / oil process). This skin must then be smoked, at which point formaldehyde enters the skin (chemical process) and ensures that even if the skin gets wet, it will retain its softness. This creates a soft, shammy–like leather. Bark tanning, or vegetable tanning. This process involves immersing the skin in a tannic acid solution (chemical process). The solution is made by boiling high-tannin plant material (such as certain tree barks, nuts and leaves) in water and producing a tannin-rich, acidic tea. Once the skin is tanned through – a matter of days for small skins like rabbits, to months for deer or even years for large cows – it is then removed and rinsed. The skin is then oiled and worked soft (physical / oil process). This creates a firm, waterproof leather. Bark tanned deer skin – the bark also gives the skin its rich colour. There are a number of other methods, including the use of synthetic chemicals, though often these are neither good for the tanner nor for the environment (see below). Hide tanning is an ancient craft. Humans are different to most animals in a number of ways – a significant one being that we don’t have much in the way of insulative fur or any protective scales. We require clothes in many climates, to keep warm, safe, shaded, and camouflaged. Archaeological finds suggest that hide tanning was carried out by our ancient ancestors, as far back as 70,000 years ago, through the study of various flint scraping tools. Leather would have been the main ‘fabric’ for thousands of years. There are wall paintings of tanning in Egypt, and leather clothing, many thousands of years old has been found preserved in peat bogs throughout Europe. Many indigenous hunter-gatherers still use traditional tanning techniques, all over the world, from Northern Inuit and Sami to sub-Saharan Africa and North America. Hide tanning from start to finish. Tanning in Europe was a major occupation, and many traditional tanning techniques have been lost – replaced by industrial chemical processes. There has been a resurgence however – in particular in North America, via the primitive skills movement, and in Scandinavia, learning from traditional Sami techniques. What skins can be tanned, and what are they used for? Furs (for example rabbit, squirrel or fox) can be brain tanned or bark tanned: great for hats and cold-weather clothing. Deer skins* (rawhide): a hard, inflexible, untanned skin useful for drums, containers or cordage. Deer skins* (buckskin): a soft ‘shammy’-like leather made using the emulsifiable oil technique – useful for clothing, bags and moccasins. Deer skins* – bark tanning creates a firm waterproof leather that’s great for bags, straps and belts. Sheep skins (with the hair kept on) can be brain or bark tanned, great for rugs or coats. Fish skins: can be brain tanned or bark tanned for a textured, strong material, good for bags, clothing and jewellery. Glue: any mammal skin can be made into a water-soluble glue by boiling and reducing the liquid. The glue is made from collagen in the skin. *or any other hoofed animal such as sheep, goat, moose etc. Tanned skins, left to right: bark tan deer, fox fur, bark tan salmon, brain tan deer, rabbit fur, bark tan deer. Soaking – in an alkaline solution such as wood ash or hydrated lime (this dissolves mucous, makes the hair slip out and puffs up the fibres). Dehairing – using a tool to remove the hair (for buckskin also removing the grain – the outer layer of skin). Scraping – fleshing and membraning – removing excess fat, flesh and membrane (skin layer). Rinsing – rinsing out the alkali and bringing the hide back to neutral or acidic pH. Stretching a deer skin – an important step in making the skin soft. Bark tanning: soaking the skin in tannin solution – initially a weak solution, gradually getting stronger, until the hide is tanned through. Then softening with oil. Deer skin soaking in oak bark tanning solution. It’s worth mentioning the predominant way most modern leather is tanned – in commercial tanneries, using a chromium solution. The chemicals used in this process are particularly harmful, and when allowed to leach into waterways, cause problems for humans, animals and plant life. Often these tanneries are located in developing countries with more lenient environmental and work safety laws – so they can more easily get away with polluting waterways and harming the health of workers and local residents. 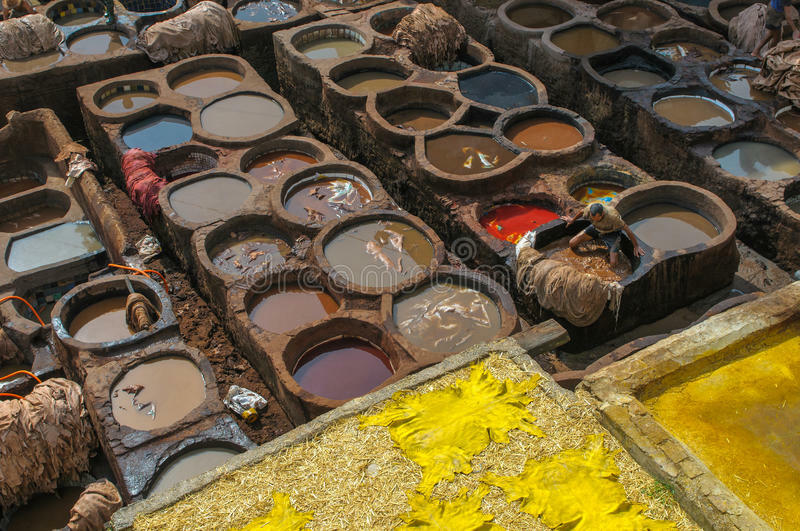 Leather tanning and dyeing in Fez, Morocco. What are the benefits of hide tanning? By tanning in a traditional, natural way you are creating an alternative to the extremely damaging commercial chemical tanning industry. Almost everything needed – skins, bark, brains, etc. – can be obtained for free, and you can create a useful product from biodegradable, non-toxic materials that might otherwise have been thrown away. When working with skins, people feel a sense of connection to the natural world around them, and to our ancestors who would have tanned as part of their everyday lives. If you’re tanning anything the size of a deer skin or larger, you get a great upper-body workout as you persevere to work it soft for hours! You ‘re helping to revive an ancient skill, that could also be turned into a career. The end result – leather – can be crafted into beautiful, useful things. Students on a tanning course softening a buckskin. Hide tanning is a tactile skill which involves paying attention to subtle differences in the skin, and is not easily learnt from a book. You can attend a course in hide tanning; and there are some useful websites and resources here. There are a few key tools and pieces of equipment needed to process larger skins – a scraping tool and beam, and some softening tools. Once you get an understanding of the process and the tools, it’s totally doable in a garden or even out in the woods. Fish skins can be done in the kitchen, as they’re small and don’t make much mess – but other tanning is best done outdoors. It shouldn’t be a smelly affair – unless you leave something too long and it starts to rot! Scraping deerskins on beams (wooden and plastic) with metal scraping tools. Deer skins – from deer stalkers or deer farms. Rabbits, foxes and squirrels – whether you agree with it or not, all of these are considered pests on some farms, and are culled. They are often then thrown away or left to rot on the land. Talk to local farmers and find out if you can divert their waste and make something beautiful out of what would have been disposed of. Fish skins – can be obtained by asking nicely at your local fishmongers. Freezing – skins will keep well for a long time in a freezer (this is the only option for storing fish skins). Salting – sprinkling the flesh-side of the skin with salt and letting it drip dry then rolling and storing away from animals (this is just a storage method, and not, as is commonly misunderstood, a part of the tanning process). Drying – so long as a skin remains fully dry, bacteria cannot begin the decay process (though insects and rodents might damage it). Rawhide drying in a rack – to make a hard, strong material. And of course tanning is just the first stage of the transformation of raw material into beautiful fabric, which can then be crafted into many different creations. Sewing buckskin / leatherwork is an art in itself, and with this you can create clothes, bags, shoes, belts, and so much more. Thanks to Jessie Watson Brown of Nettleseed for information and pictures. Jessie Watson Brown is on a path of rewilding and reskilling. Weaving together a deep reskilling through making and crafting using natural materials, with immersing herself in the natural world and learning the ways of our ancestors. She is a tanner and basket weaver. Jessie is based on Dartmoor, Devon, and along with Jane Robertson, offers courses and camps in tanning, craft, wild skills and nature connection. More information can be found at Nettleseed.